Superb pair of lacquered tables in the chinoiserie style. Brass frames, the larger open and the smaller x-framed and crowned in the centre. 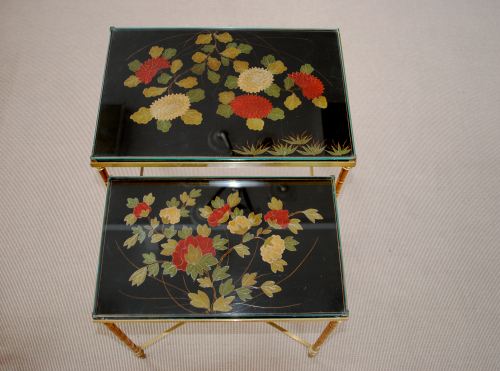 Floral lacquer work, protected by newly cut glass tops. Large: 49 cm high by 45 cm long and 30 cm wide. Smaller: 44 cm high by 40 cm long and 25 cm wide. Very good condition. Lacquer almost flawless.